Yinarupa Nangala is a Pintupi woman who was born west of what is Kiwirrkurra community today, towards Jigalong. 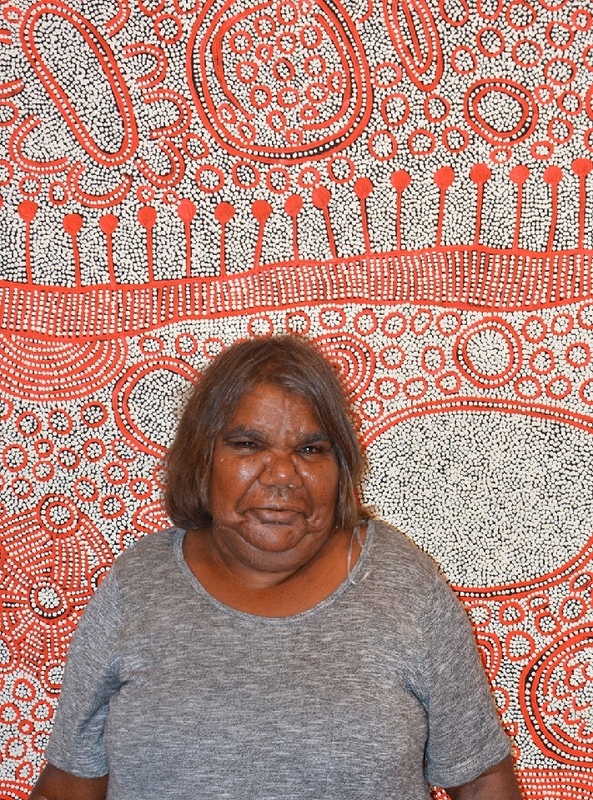 She is the daughter of one of Papunya Tula Artists greats, Anatjari Tjampitjinpa; sister of Ray James Tjangala and half-sister (by Anatjari) to Mantua. Yinarupa Nangala was a co-wife with, amongst others, Ningura Napurrula of another Papunya Tula great, Yala Yala Gibbs. Thus, she is also related by marriage into George Ward Tjungurrayi's and Willy Tjungurrayi's families. Yinarupa started to paint in 1996, her motherhood duties being substantially complete. For some time she gained only moderate recognition for her works.This gradually changed in the late 2000s and by 2009 her somewhat austere style was finally be recognized for what it is, classic Pintupi art at its best. She paints the country around Mukula and the women's ceremony associated with it. The story is passed down from her father's mother. The shapes in the painting represent the features of the country, as well as bush foods. Women are represented by the 'U' shapes and kampararpa berries are represented by the circles. The tree like shapes that run across her paintings are the trees used to make spears. This is Yinarupa's unique representation of the story that Turkey Tolsen and his sister, Mitjili Napurulla, paint (both of whom are also family).